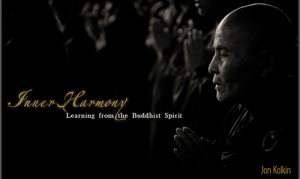 Although the first photographs for Inner Harmony… Learning from the Buddhist Spirit were not taken until 2011, the seeds for this project were first planted in 1994. At that time I was working as a teaching physician through Health Volunteers Overseas (HVO) at Da Nag General Hospital in Vietnam. During a weekend excursion, I hiked up Marble Mountain and came across the entrance to a dark cave. As I climbed down through the opening, it suddenly widened, revealing a tranquil, majestic cavern, illuminated by beams of natural light piercing through the darkness from high above. Inside this sacred space was a diminutive Buddhist temple and, not far away, a towering statue of Buddha, carved out of the cavern’s sidewall. I was moved by the power of this expansive, yet peaceful, contemplative, and understated sanctuary. During my 11 subsequent assignments in Vietnam, Nepal, Bhutan, China, India and Myanmar, I was often immersed in the fabric of local Buddhist communities. In 2011 I travelled to Wenzhou, China, a frenetic city of 9 million people, rarely visited by Westerners. An influential group of Chinese photographers arranged an audience for me with the headmaster at the Taiping Temple, a cloistered enclave of 100 Buddhist nuns, situated in the heart of the city. The minute I walked through the entrance to the monastery, I was struck by the tranquility, order and harmony that I sensed existed in this oasis. During meetings with the Taiping Temple’s headmaster and her representative, I explaining my intentions and showed them images from previous work. After a few days I received word that I had been given permission to return that evening and photograph during a special ceremony. Restrictions included staying in the back of the sanctuary, no flash, no photographs of the nuns’ faces and approval by the master before using any images. As I entered the sanctuary I was greeted by a dimly lit, expansive space, with high ceilings, and a towering statue of Buddha. The faint scent of incense hung in the air and nuns’ filled the chamber with the sound of their rhythmic chanting. As I moved silently through the space, I sensed these devout monastics had achieved a state of inner harmony, looking inward in their quest for wellbeing, or what we in the west might call “happiness”, rather than expecting it to come from external sources. This concept resonated with me, as it reinforced my own observation while living in many underserved countries that there was no direct correlation between monetary wealth and wellbeing, except in cases of extreme poverty. A few days after the ceremony I returned to show the preliminary photographs to the headmaster. Two days later I received a call from her representative, informing me I would have broad access to almost the entire compound, day and night, during ceremonies and other activities. However, whenever possible, I sought permission from individual nuns before photographing their faces. Now that I had permission to photograph, I felt compelled to artistically capture this state-of-mind. 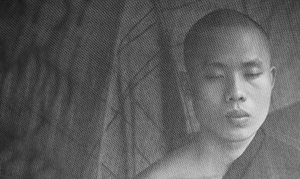 Integral to my vision was the decision to present Inner Harmony… Learning from the Buddhist Spirit as black and white, Palladium prints. 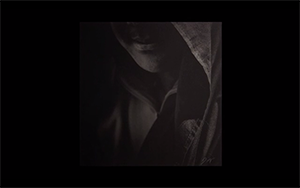 It was my sense that this approach would help create a contemplative environment that draws the viewer inward, more in tune with what is going on inside the subject’s mind as opposed to their external appearance. In hindsight, my entrance into the Taiping Temple complex and sanctuary paralleled my entrance into the cave on Marble Mountain and unexpected emersion into an expansive, light-filled, spiritual setting. I now realize Vietnam represented the embryonic stages of my journey toward a deeper appreciation of Buddhist philosophy and the birth of Inner Harmony… Learning from the Buddhist Spirit. Since the intent of the project has been to artistically capture a philosophy as opposed to a physical place or branch of Buddhism, I have had the latitude to continue working on Inner Harmony for many years while living on numerous occasions in Bhutan, Myanmar, India, the United States and China. I am hopeful this body of work will resonate with a broad audience, as I feel the underlying message is powerful and of universal importance.